We know that one of the most critical needs for businesses is a skilled workforce. Eastern Kentucky has the talent your business needs to thrive. Determined, dedicated and innovative, our region’s workforce possesses an incredible work ethic and valuable skills. However, that is only opinion unless the data proves it true. Thus, One East Kentucky partnered with multiple agencies across the region as well as Boyette Strategic Advisors to conduct an in-depth analysis of our workforce. 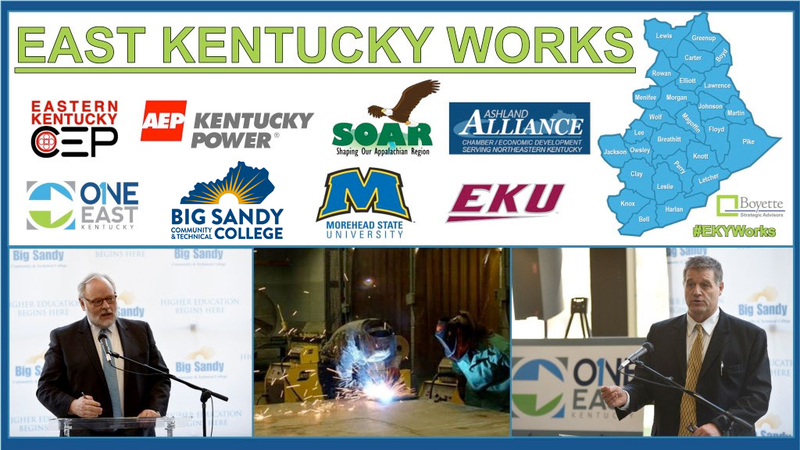 Specific information about the One East Kentucky regional workforce can be found on our LABOR page. The full study is available below. Prestonsburg, KY. December 3, 2015– Multiple economic development, educational and workforce related agencies are partnering to commission an in-depth analysis of east Kentucky’s robust labor pool. They gathered today at Big Sandy Community and Technical College in Prestonsburg to announce the kickoff of a 27-county workforce study. “When it comes to recruiting new investment from companies across the United States as well as internationally, we must have the data to support our claim that East Kentucky has the best available workforce in the country”, said Chuck Sexton, CEO of One East Kentucky. As the eastern Kentucky region’s primary industry, coal, has continued to decline with layoffs, closures and company relocations, regionalism as well as partnerships have become more important than ever to diversify the economy. New agencies, such as SOAR and One East Kentucky, have developed to both prepare the region for investment as well as find the companies willing to make those investments. Existing agencies, such as EKCEP and Ashland Alliance, are doubling-down on their strategies to aggressively assist the unemployed and prepare them for new jobs. The partnership group hired Boyette Strategic Advisors (BSA) to complete the 27 county study. Led by founder Del Boyette, a seasoned economic development professional, the team will take several months to study east Kentucky’s workforce based on sub-regions. Several strategies will be implemented during the study, including sub-regional public forums, reaching out to unemployed workers, analyzing national databases and interviewing existing employers to understand the quantity and quality of the area’s workforce. Higher education institutions Big Sandy Community and Technical College, Morehead State University and Eastern Kentucky University see the immense value that this information holds as well. Over the next four months, BSA will seek input around the region, and the partnership group asks the public to be prepared to assist in the process.